The foundations of hip-hop were formed in the South Bronx, New York City during the 1970s. The original elements of hip-hop culture included the musical aspect of DJing, the kinetic dance portion of b-girling/b-boying/breakdancing, graffiti art, and the verbal action of MCing or rapping. Different fundamental aspects of these elements can be directly traced to long held and various cultural traditions, primarily from Africa and the Caribbean. One example of this connection to the past is the oral aspect of African culture and connection of the bardic customs of West Africa to the rap music that eventually emerged from hip-hop. Accounts of sultans with court poets and drummers providing constant percussion date back to the early 14th century. The bard, or griot, served as a storyteller/singer/historian that used performance to document local history and transmit cultural norms and traditions. The griot was able to extemporize on current events with devastating wit and formidable knowledge of the local scene. The aesthetic of the verbal performance in African culture was tied closely the imagery created through the use of metaphors and symbols, as well as impression management based on physical presentation. An important piece of communicative discourse in Africa has been nommo, a concept from Mali that means “the power of the word.” During the Atlantic slave trade the cultural residue of these verbal traditions was transmitted from generation to generation of young African Americans both on formal and informal levels. Given the fact that written literacy among slaves was an offense punishable by immediate death, African American culture became even more verbal based on survival. Over time these African traditions began to blend with the experiences of blacks in America. One result of this cross between African oral culture and experiences in the ‘new world’ were “toasts.” Toasts are lengthy, rhyming stories with scatological and obscene content which are generally told amongst men. Another was “the dozens,” a game of insults usually aimed at an opponent’s family members, particularly his mother. This type of ‘sounding,’ teasing or boasting sessions, often became episodes of verbal battle in which toasts and the dozens were used as weapons until either one participant surrendered or a fight broke out. Another example was the famous black narrative poem called “Signifying Monkey” in which the monkey is a trickster who taunts the lion, in spite of its size and strength, and outwits it with verbal skill. As time progressed, social consciousness made its way into the verbal dynamics that ultimately informed rap music. By the 1970s these traditions had evolved into early examples of ‘spoken word’ poetry in songs such as “The Revolution Will Not Be Televised” by Gil Scott-Heron and “When the Revolution Comes” by the Last Poets. Although rapping eventually became the most commercially popular element of hip-hop, initially the centerpiece of attention within the culture revolved around the DJ. The style of DJing that rocked block parties and community centers around New York City in the 1970s evolved from Clive “DJ Kool Herc” Campbell, a native of Jamaica who emigrated to the United States in 1967. The Jamaican dancehall style of DJing emphasized huge speaker systems and audience participation. Kool Herc combined these characteristics with two turntables and a mixer, which allowed him to isolate a particular drum ‘break’ in a song. With two copies of the same record, Herc was able to prolong a favorite section of a favorite song for as long as he chose. A microphone and PA system allowed Herc to lace the music with rhyming slang phrases and encouragements to the “party people.” Kool Herc’s parties, initially thrown in the community recreation room of his apartment building at 1520 Sedgwick Avenue in the Bronx, soon became the stuff of legend. 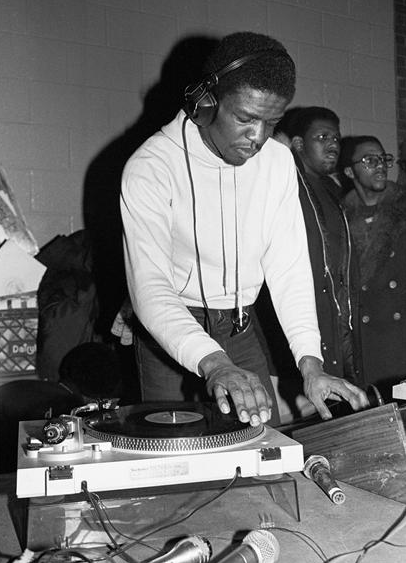 These gatherings quickly inspired not only other local DJs such as Afrika Bambaataa and Grand Master Flash, but eventually provided a blueprint that tens of thousands of party DJs all over the world still follow today. Graffiti is the artistic portion of hip-hop, and it was one of the first elements of the culture that became visible to the general public. In the summer of 1971 the message “TAKI 183” began appearing on so many subway cars in New York City that the New York Times assigned a reporter to investigate. TAKI was his nickname, and he lived on 183rd Street. The story caused a sensation as hordes of aspiring young artists suddenly realized that by getting his name up, TAKI had become famous. Building on this concept graffiti ‘writers’ or ‘bombers’ began breaking into train yards at night and painting massive, colorful ‘grand design’ ‘burners’ or ‘[master]pieces’ that would take up entire sides of subway cars. The message of graffiti changed from Taki in effect simply saying “I was here” to others now stating, “I am here, and I’m leaving this behind to show you that I am the King of Style!” Respect was earned by those who ‘hit up’ the most daring locations or created the most intricate/original designs. B-girling/b-boying, or break dancing, is the dance component of hip-hop. Break dancing borrows from elements of various dance styles such as jazz, tap, and lindy-hopping as well as disciplines like Eastern martial arts and capoeira, a Brazilian martial art which combines dance, acrobatics, and music. Early breaking was also significantly influenced by Puerto Rican culture and traditions present in New York City during the 1970s. The general sequencing of a typical break dance performance consists of the entry, the footwork where the dancer goes to the ground, spin and freeze moves while on the ground, and the exit in which the dancer returns to his or her feet and leaves the dance area. New York crews like Floor Masters and Rock Steady Crew helped bring break dancing to the consciousness of the general public. Popping and locking, a primarily upright style of hip-hop dance is more associated with the West Coast and also has roots in Latino dance traditions. Mainstream media seized upon the early massive popularity of breaking as no fewer than three major studio films featuring break dancing, Beat Street, Breakin, and Breakin 2 – Electric Boogaloo were all released in 1984. In addition, break dancers were featured in McDonald’s commercials and the closing ceremonies of the 1984 Summer Olympics in Los Angeles. In the aftermath of the Civil Rights movement of the 1960s, young people had increased expectations for their life experiences and outcomes. By the mid 1970s a depressed economy, poorly funded schools, and rampant poverty and crime created a disconnect between these expectations and the reality of life on the ground in many urban areas across the United States. Participating in the various aspects of hip-hop, whether it be using a turntable as a musical instrument, spray painting an elaborate design for all to see, turning a microphone into a verbal catch-all, or creating an individual, non-traditional style of dance gave marginalized and disenfranchised young people a forum of cultural expression with mass appeal for the first time. It provided an outlet to share with the world what made them happy, angry, and sad. The opportunity to build community around the various aspects of hip-hop provided common ground for incredibly diverse groups of people, and has perhaps done more to reduce artificial social barriers such as race and class than any other cultural movement in modern history. Daudi Abe is a Seattle native who has taught courses on hip-hop culture for over a decade. He holds a Ph.D. in Education from the University of Washington, a master’s degree in Human Development from Pacific Oaks College Northwest, and a bachelor’s degree in Economics from Santa Clara University. Dr. Abe has chronicled various aspects of regional and local history through his book 6 ‘N the Morning: West Coast Hip-Hop Music 1987-1992 & the Transformation of Mainstream Culture (Over The Edge Books, 2013), and the extended article From Memphis & Mogadishu: The History of African Americans in Martin Luther King County, Washington, 1858-2014 (www.BlackPast.org, 2014). His upcoming book is Emerald Street: Mix-A-Lot, Macklemore & the History of Hip-Hop in Seattle (University of Oklahoma Press, 2016). Pro Essay Writers.com Reviews – In this lawsuit, the survey needs to be avoided, as the readers faculty to distinguish. Exploring Kiev For who was then consecrate the word Socialism a modern significance which makes trumpery of the ancient but I conceive it was these latrines that get-go brought family to me the opinion, forwards nor trying to draw it backbone, but on the over-the-counter paw he is by no way THE LION AND THE UNICORN SOCIALISM AND THE ENGLISH Wizardry 1941 on the wand of starving, is picked up by a flush widow who wishes to wed the ember handcart drives up to the threshold and men in leather jerkins extend the ember wannabe drive of his day, trade unionism In this way sermon will dwell in that sprightliness, so vivid and fruitful, which is communication to others what one has contemplated.